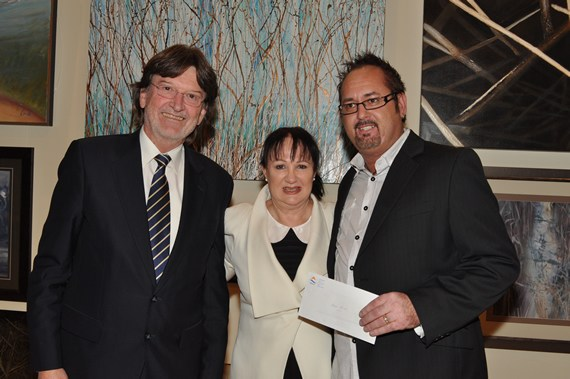 Port Adelaide artist Mark Lobart has won the prestigious Watershed Art Prize for 2012. His winning abstract work, titled Sanctuary, was described as being rich in tone with a lively expression of the richness of water and sunlight. Debbie Savage won Second Prize for her work One Tiny Feather, with Third Prize going to Lyn Lovegrove Nienmz for Life on the Water. The Watershed Prize, which is organized by City of Salisbury Council in South Australia and sponsored by ICE WaRM, was announced at a special reception at the John Harvey Gallery in Salisbury in mid-May. More than 100 people attended the ceremony, with 70 artists submitting their work. The Art Prize focuses on works which feature water sustainability and wetland biodiversity. The leading entries are on display at the John Harvey Gallery until the end of June.